They call the robotic panel installer Rover and they call the robotic panel cleaner Spot. Here’s how Alion Energy CEO Mark Kingsley said the automated project construction and maintenance system will work: After the ground is prepared, a mixing truck and concrete slip extruder fill pre-designed molds to form a non-penetrating, ballasted foundation rack that eliminates metals, bolting, and clips. Next, a human rolls a customized cart that lays cable in the channels in the concrete. Then comes Rover, laying out the panels it carries. Construction adhesives affix the panels to the concrete racks, further eliminating bolting and the labor it necessitates. After the project is wired and on-line, Spot takes over. 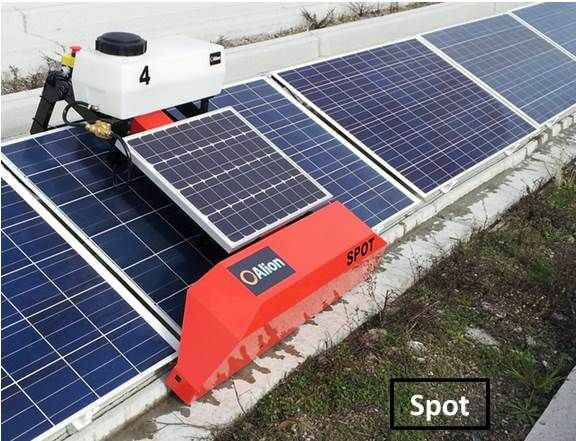 Powered by its solar-charged battery, Spot rolls along concrete tracks that keep its weight off the panels. Spot can be programmed for wet or dry cleaning at selected intervals and activated from a smart phone. It can also clip the ground cover between the concrete racks and manage the project’s drip irrigation system. 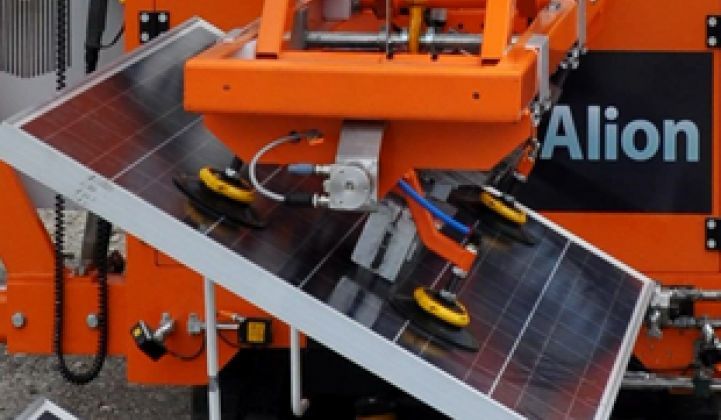 Kingsley and Atkinson mentioned a helpful robotic system for installing metal posts from Schletter; QBotix employs paired autonomous mobile robots for maximum tracking accuracy. Robotic automation is also common in manufacturing. The path to solar power plant automation began for Alion with the study of continuous ribbon manufacturing processes in thin film. But, Kingsley said, there wasn’t enough differentiation there. Alion estimates its revenue opportunity in structural balance-of-system and labor to be over $7 billion and its profit opportunity at upwards of $550 million for 2013. 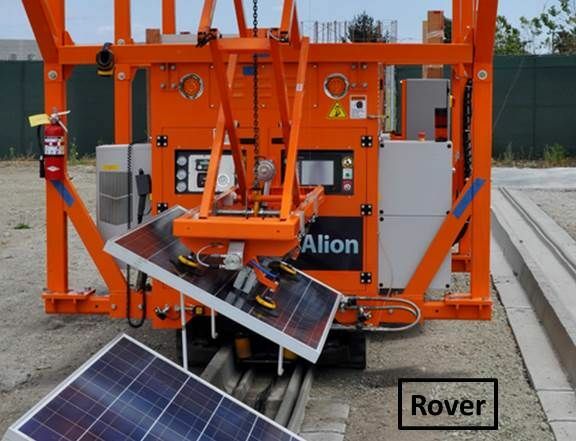 On the basis of its accomplishments to date and its team’s experience, Alion claims it will add about 1.5 percent to the internal rate of return of utility scale solar projects, cut project construction time in half and reduce labor costs by 50 percent. The company will also have completed projects validating its concept in Asia, the U.S., and the Middle East by the end of 2013. With the robots barely in service, much of the question of project durability, and therefore bankability, rests on Alion’s answers about concrete. In projects where conditions are particularly corrosive or subject to extraordinary wind loads or where the ground is unsuitable for metal posts, Kingsley said, the metal is now set into concrete ballasts because of its sturdiness. The low-to-the-ground profile of Alion’s installation design provides further protection from wind loads, he added. Concrete is what sidewalks and freeways are made of, Kingsley noted, and deterioration and failures are rare. But Alion must nevertheless still prove its concept’s practicality and endurance. The adhesives Alion uses, Atkinson said, are also used in the construction of bridges and buildings and have been known to last in the field for upwards of 30 years. Alion’s construction materials and concrete mounting structures have passed all the same testing processes that panels and metal racking products go through, Kingsley said. But, as GTM’s series on panel bankability has reported, those tests leave questions about durability that only time can answer. “The basis of an IRR calculation is time, the value of money and the actual cost,” Kingsley said. Alion’s promise of a 1.5 percent increased return is based on its claim to build -- when it builds a project -- faster and at a lower cost, with fewer, cheaper structural balance-of-system materials and 75 percent fewer labor-hours.